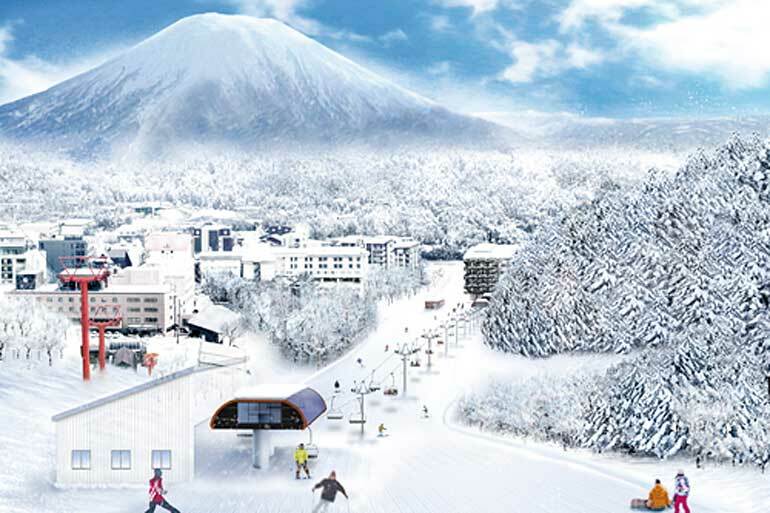 Niseko Tokyu, owner / operator of the Niseko Grand Hirafu Resort, has announced they’ll be upgrading the Ace Family Pair lift for the 2017/18 season to a new, longer quad lift. Read the original announcement (Japanese Only). Due to be completed in December, 2017 (UPDATE 24/11/2017: both the Ace Family Quad Lift in Grand Hirafu, and the Dream Quad #1 in Annupuri are scheduled for completion by December 1) the lift will be longer by almost 250m with the new top station drop-off moving further up towards top of the Sen no Ki Course (Thousand Trees Course). As a special feature for beginners, the lift is capable of slowing down to less than 1m/sec to help new skiers and boarders as they learn to get on and off the lift. This is intended to reduce congestion on the main beginner course as well as provide a new access route to the King Quad, the .Base restaurant and the parking lot. Whilst it was not mentioned in the press release it seems that the base station will likely also be moving a little further up from its current position in order to make more space available for ski schools instructing at the base. We won’t be sure of the new location until the construction gets further along though. The new high-speed lift will move along at a steady 5m/sec – up from the previous 1.8m/sec – and will transport guests in as few as 3 minutes from the base to upper station. At maximum capacity the lift is expected to at least double its carrying capacity from 1,200 people per hour to 2,400. Construction is already underway with the old Ace Family lift base station knocked down last week and works are scheduled to continue from July 18th. No specific date for completion has been set as yet but we’d imagine they’ll be aiming to complete it by early-to-mid-December when the Ace Family usually opens and the snow gets deeper around the base. Congestion on the Family run has only been getting worse over the last decade with new larger premium accommodations going up as well as more ski schools competing for space on the run – not to mention the groups of Japanese school kids on school snow trips that regularly clog the run in peak periods. SkiJapan.com and all of the other accommodation operators have petitioned the resort to replace this lift for many years. The fact that it is finally getting this much needed upgrade is a great relief to us all – particularly for guests staying in ski in / ski out accommodations like Alpen Ridge, The Vale Niseko and Aya Niseko. Hopefully this is a signal that the resort is taking infrastructure development more seriously now especially given the number of large hotel-style developments underway in the upper village, like Skye Niseko and the Maples. The announcement of the upgrade follows last week’s news from Niseko Annupuri that they’ll be installing a new beginner quad lift. Read the original Japanese announcement. The Dream Quad Lift #1 will carry guests from the base of Annupuri half-way up the main beginner course, the Junior Course, dropping guests off just in front of the Niseko Northern Resort Annupuri. The new lift will result in easier access to restaurants and facilities. We expect the new lift will be a boon to beginners riding at Annupuri given that navigating the upper end of the Junior Course was more than a little challenging. Beginners that used to spend most of their day riding around the base and walking back up the slopes will have access to more terrain and longer runs without tiring themselves out. The new lift is also designed to run at slower speeds near the base stations to make it easier and safer for beginners to get on and off the lift. The announcement also indicated that there may also be some work undertaken to widen areas around the new lift but no specifics were mentioned. Given how many people use the narrower Junior Course to traverse to the base, rather than ride down the much steeper Dynamic Course, we can only hope that they’ll be giving the top part of this course some of the widening treatment as well. With a large number of new condominiums and chalets popping up in the Annupuri village, including the luxury 5 star Kamui Niseko condominiums completed last December, we imagine that that the new lift will result in Annupuri village becoming a more popular destination in the Niseko area for customers that enjoy the quieter village style and love the kind of wide open powder and tree runs on offer on that part of the mountain.